Make sure to enjoy today, as it is set to be the driest and brightest of the weekend according to Met Éireann. THE WEATHER OUTLOOK for the Bank Holiday weekend is not all that encouraging, with heavy rain forecast on Saturday, Sunday and Monday. Today is set to be the driest and brightest of the weekend, with Met Éireann forecasting “sunny spells developing, with any showers light and well scattered”. Temperatures will range between 14 and 18 degrees, with moderate southwest winds on Munster and Connacht coasts. These same coasts should get heavy rain tonight, but the rest of the country will stay relatively rain free until tomorrow. Mainly dry & bright. Some sunny spells, light well sctd. shwrs. 14/18C. Mod. SW winds, fresh at times, on S & W coasts. Temperatures will range in the mid to late-teens again tomorrow, with some bright or sunny spells interrupted by bouts of widespread showers and some heavy rain. Sunday will start drier but will give way to widespread, heavy rain by the afternoon. 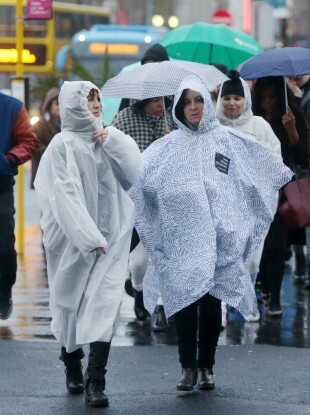 The rain will carry over into Monday morning, with temperatures cooling to a high of 16 degrees. Beyond that, the outlook is not good either. As we enter June, the Irish summer has well and truly arrived. Email “Heavy rain forecast as we're set for a wetter, cooler bank holiday weekend”. Feedback on “Heavy rain forecast as we're set for a wetter, cooler bank holiday weekend”.